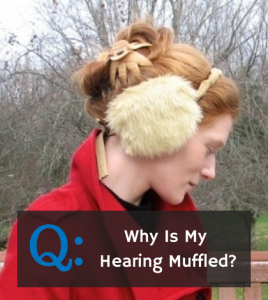 Everyday Hearing > Hearing Loss > Why is My Hearing Muffled? If your hearing sounds muffled, or you feel like there is “cotton in your ears”, there is likely a good explanation. Muffled hearing can come about gradually or suddenly, depending on the underlying problem. It may also occur in one ear or both ears. We will discuss some of the most common reasons why your hearing sounds muffled. 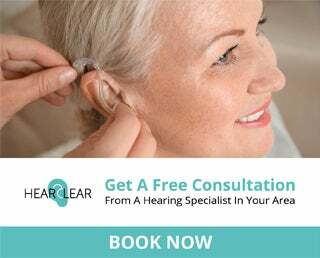 Before you continue, if you think that you are experiencing hearing loss you should always get a free consultation from a trusted hearing center in your area. They will be able to recommend the most appropriate treatment for you. Your ears are plugged with wax or other debris. Most likely you will start to notice your hearing becoming more and more muffled over time as the wax begins to build. This may occur in one ear or both. Don’t put anything in your ears (including a Q-tip) to clean it out, as this can result in pushing the wax further in the ear. If you see an Audiologist or Ear, Nose, and Throat physician they will be able to look in your ears to determine if you need them cleaned. Once the wax is gone, your muffled hearing should improve. You have an asymmetric hearing loss. An asymmetric hearing loss means that your hearing is worse in one ear than the other. Sometimes people who have a difference in hearing between the ears, describe a muffled sound quality in the poorer ear. This is especially true if there is a sudden change in hearing in one ear. This difference in hearing between the ears leaves your brain confused and you may experience a “plugged” or “full” sensation in the poorer ear. 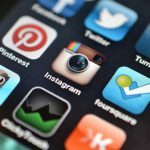 You may notice an asymmetric hearing loss if you hold the phone up to each ear. 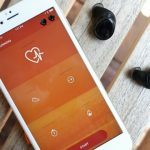 The phone will sound louder or clearer in the better ear and you will notice a significant difference in the way each ear is hearing. If you experience muffled hearing or a sudden change in hearing in one ear, see an Ear, Nose, and Throat physician immediately. The sooner the sudden hearing loss is treated, the greater likelihood the hearing will return. If you have an outer ear infection or a middle ear infection, your ears may be filled with a fungal or bacterial infection. This will likely temporarily affect your hearing and may make your hearing sound muffled in the affected ear. An ear infection can occur in one ear or both ears and should be treated by a physician. You have Eustachian Tube Dysfunction. There is a small tube that connects the middle ear space with the back of the nose and throat. This tube opens and closes to equalize the pressure between these two air-filled spaces. When you quickly change altitude when going up in an airplane or when scuba diving, that is the “popping” feeling you may feel in your ears. Sometimes people may have difficulty with the functioning of this tube, especially if they are experiencing sinus issues. When the Eustachian tube is not opening and closing properly, it may feel like your ears are clogged and your hearing may sound muffled. This is usually temporary and your muffled hearing will improve once the Eustachian tube clears. The only way to verify whether Eustachian Tube Dysfunction (ETD) is the cause of your muffled hearing is to have an evaluation by an Audiologist or Ear, Nose, and Throat physician. You have a significant high-frequency hearing loss. 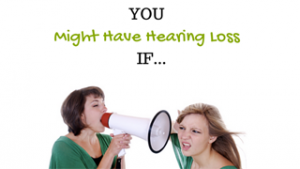 When you have a high-frequency hearing loss you have difficulty hearing high-pitched sounds. This includes the consonant sounds of speech more than the vowel sounds. 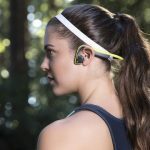 Many people with high-frequency hearing loss complain that they “can hear but can’t understand what people are saying”. That is because when you are not able to hear the consonants of speech, the speaker sounds like they are mumbling or not speaking clearly. In order to determine whether you have a high-frequency hearing loss, a thorough evaluation by an Audiologist is recommended. 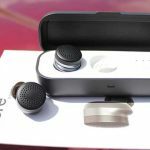 Hearing aid technology can help to overcome a high-frequency hearing loss and make speech sound clearer. If you experience muffled hearing in one ear or both ears it is recommended that you see a hearing healthcare professional. They will be able to tell you which of the above conditions you are experiencing. For some more information on muffled hearing, we’ve put together a small presentation. Check it out below!